Dr Easkey Britton is a professional marine social scientist whose work explores the relationship between people and nature, especially water environments. She has a PhD in Environment and Society. Easkey is a post-doctoral research fellow at the Whitaker Institute, National University of Ireland, Galway, where she co-leads the interdisciplinary NEARHealth work-package on nature-based solutions, exploring the use of blue and green space to restore health and wellbeing. Her work on SOPHIE will focus on ensuring everyone has a voice in setting the direction of oceans and human health research, identifying key people who should be involved in the stakeholder discussions. 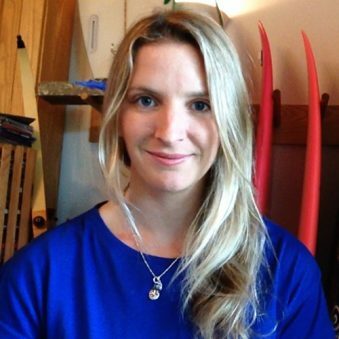 A life-long surfer, Easkey’s parents taught her to surf when she was four years old and she channels her passion for surfing and the sea into social change. Her work is deeply influenced by the ocean and the lessons learned pioneering women’s big-wave surfing in Ireland and introducing the sport of surfing with women in Iran. Passionate about facilitating creative & collaborative processes, Easkey founded Like Water, a platform to explore innovative ways to reconnect with who we are, our environment and each other, through water. Watch a recent film Easkey made about her connection to the sea and its cycles below.